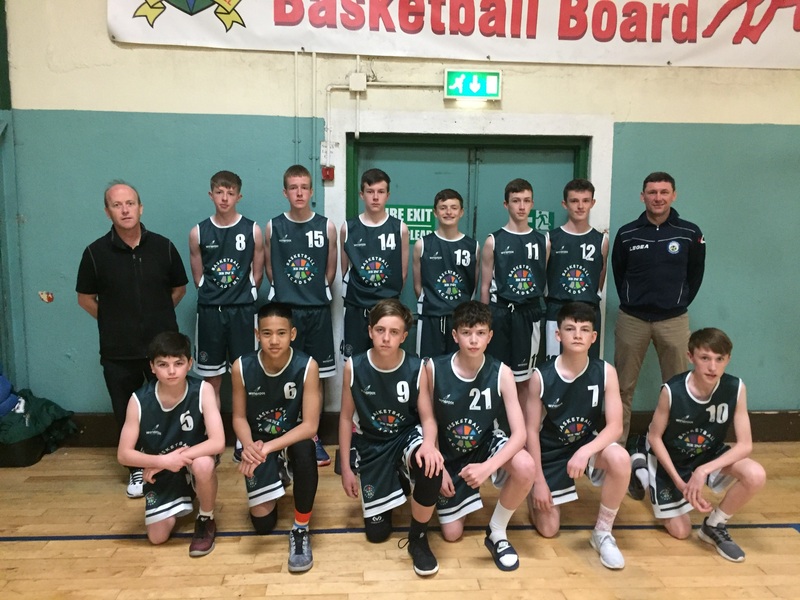 In preparation for a match-up against the Scottish national team, on Saturday June 3rd, the Under 14 boy’s Academy traveled to the parochial hall in Cork on Saturday 12th May. The boys arrived in time to watch a very strong Cork team easily beat the Dublin squad. First up for BNI was the victorious Cork team. A steady start saw BNI stay level until the closing minute of the first quarter with Cork taking a 19-11 lead. The second and third periods were tough with BNI struggling to score but playing well defensively. The fourth quarter saw the best basketball of the game with each team scoring 15 points. Cork won 55-34 in the end. Adam Hanna 3, Niall Quinn 4, Niall Morgan 5, Darragh Ferguson 5, Paul O’Neill 4, Iandle Alvarado 11, Killian Gribben 2. The next match v Dublin started almost immediately and BNI started strongly taking an 11-9 lead with Dublin struggling to handle the full court pressure early on. A tight second quarter saw Dublin hang in and BNI were a point up at half time, 22-21. Dublin came out strong in the 3rd with their guards driving and scoring a number of baskets to take a 1 point lead going in to the final quarter. In the 4th 2 big 3’s from Iandle Alvarado and a further 6 points from Darragh Ferguson saw BNI finish the game 50-48 winners. A tense game which will teach the boys how to handle pressure in upcoming games. Adam Hanna 7, Niall Quinn 2, Eoin Millar 4, Darragh Ferguson 19, Paul O’Neill 4, Iandle Alvarado 8, Killian Gribben 6. The U14 Boys play host to the Scottish National team in June, if you would like more details of this event please contact the Academy Officer. Finally a big thank you to one of the fathers of the team who sponsored the hire of the mini bus for the trip.